How the pilots in The Super Dimension Fortress Macross controls the VF1 in Battroid mode? In Fighter and GERWALK modes, a Valkyrie pilot controls the craft from a traditional aircraft-style cockpit, but how is this achieved in Battroid mode? The upright mode allows for precise humanoid movement, but is it done by using the same cockpit controls (stick/pedals) as with the other modes, or is there more to it? Foot pedals and sticks are a large part of it, but the helmet included a neural interface which allowed the more finessed control. Max Sterling's exceptional abilities as a pilot were, in part, attributed to his ability to drop into the appropriate mental state (I want to say Theta waves) better than the average person. It brought to mind what Roy had told Rick about the Robotech flight helmet - the thinking cap: "You don't just pilot a Robotech ship, you live it." "The secret's that helmet," Roy said. "You generate general movements or sequences with your controls, but the Robotechnology takes its real guidance straight from your thoughts. You've got to think your ship through the things you want it to do." In what was certainly the most complicated set of mecha-motions executed to date, Max Sterling had managed to clothe his Battloid in the uniform he had taken from the Zentraedi private. That he had succeeded so completely in wedding his mind to the mecha controls was justification enough for the many articles later devoted to the feat, but the fact that he had accomplished this within the confines of a utility closet was what ultimately led to his legendary status as a VT hero. the Cyclone required the full interaction of its pilot, whose "thinking cap" and specially designed armor were essential to the functioning of the vehicle's Protoculture-based mechamorphic systems. What we know for certain is that the pilots used the joystick, throttle controller and the yaw pedals to control all three modes. In the second episode of the TV series, Hikaru's VF-1D crash lands in South Ataria and is stuck in a building in Battroid mode. Focker instructs him to depress the foot pedal lightly, and the Battroid rights itself. In several shots from the same episode we see the guns being controlled by the joystick. The movie remake of the series "Macross: Do You Remember Love?" features the upgraded Block 6 control scheme with a side stationed joystick and the throttle explicitly controlling the transformation and turning into a joystick itself. 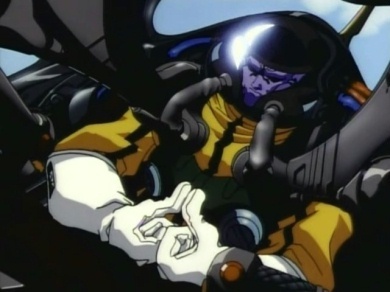 In the Robotech universe, a neural interface is added to those controls. However, in the original Macross, no evidence of such an interface exists. In fact, it wasn't until the prototype YF-21 was developed was there any canon evidence of a neural interface. And as a direct result of those flight tests, the neural interface was completely scrapped and the production version of the YF-21, redesignated the VF-22 Sturmvogel II, features a traditional control scheme. Not the answer you're looking for? Browse other questions tagged macross or ask your own question.